You have likely seen the disturbing and shocking pictures of the effect of the drought in California that have been making their way around online. What was once a lush river environment now resembles an almost canyon-like feel, where the walls of the dried out banks make the entire image seem unnatural and wrong. No matter how you feel about climate change, these images are strong, and it is impossible to deny the threat they represent to the state’s ability to function. Additionally, these pictures make one consider just how long it will be until other bodies of water within drought affected areas of the United States begin suffering the same fate. Coming up with a viable, realistic solution to replenishing the California river waters is essential to sustaining one of our most important states functionality. If a state as important to our country’s stability as California is allowed to be affected, the entire United States will suffer as a consequence. Thankfully, one recent idea is bringing a potential solution to the table. The idea is simple enough; bring the water from our nation’s Great Lakes over to California in order to help replenish their reserves. Although this idea is potentially very expensive and would require a massive amount of infrastructure creation, it could very well provide a solution that will work. With the Great Lakes being one of the most abundant fresh water sources on the planet, they have water to spare. Relocating this water to the drought affected California bodies of water could be a massive boost to the state, and thus our nation’s, ability to remain stable. California’s drought is already severe enough that it has brought upon serious consequences for Californian businesses and residents. Additionally, it has harmed the ecosystem or animal life that relies on the plentifulness of the state’s water resources. This crisis is so severe that it has been a hot topic debate and has even warranted political action. Recently, for example, California Governor Jerry Brown imposed a mandate against California residents and non-agricultural businesses that requires them to reduce their water use by a whopping 25%. While the mandate is undoubtedly necessary given the severity of this environmental crisis, it is having a negative impact on many that have to abide by the ruling. You may be thinking that such a massive relocation of water from the Great Lakes to California would just shift the problem, causing the Great Lakes to then bear the burden of an insufficient water supply. 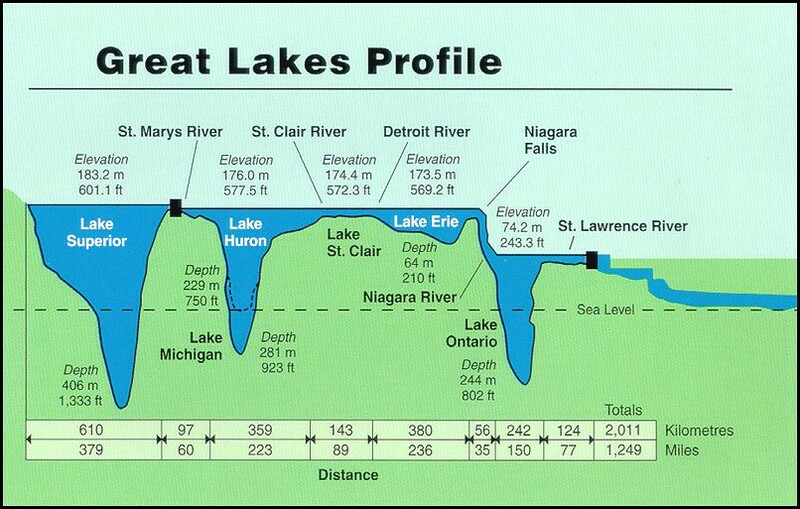 However, it should be noted that the Great Lakes contain an estimated amount of 5,500 cubic miles of water. To give you some perspective, is roughly 1/5th of the entire liquid surface fresh water on planet Earth. If spread out over the body mass of the United States, the water in the Great Lakes would be able to cover our nation 10 feet deep. With this massive amount of water, gradual relocation of California water bodies could provide a realistic and viable solution. With the lack of many other ideas, none of which compare to this idea, moving forward with this strategy could sound like an ideal solution. At the moment, unfortunately, the compact simply states that the diversions cannot happen in the way that would be required. With a “no diversions” policy, relocating the appropriate amount of water from the Great Lakes to California is next to impossible. With the intervention of the President and Congress, the road to changing the effects of the “Great Lakes Compact” could happen much faster. Before this law was enacted, some prior non-environmentally motivated plans had been considered regarding relocation of Great Lakes water. One Canadian company in 1998 attempted to create a company that would sell water to Asia from Lake Superior. If realized, they would have been using tankers to ship the freshwater from the Great Lakes to the Asian continent. In the past, it was considered financially and practically infeasible to move water from the Great Lakes in order to replenish other United States water resources. In fact, the United States Army Corps of Engineers studied the potential feasibility of using the Great Lakes to do just this in 1982. Done in order to prepare for an environmental crisis involving the lack of water directly negatively affecting agricultural states. While the task would still prove to be a very challenging, costly and politically difficult method, it is much more feasible on a practical scale than it was back in 1982. Additionally, the need for the relocation of this water is only getting more and more necessary and needed by the day. With the drought in California showing no signs of stopping anytime soon, the longer the government, both local and federal, takes to react, the more damage and costs will be maximized. Economists and environmentalists widely agree that if left unchecked, this crisis will cause major harm to the financial stability of both the state of California and the United States as a whole. Privatized interest and government obstacles are putting our nation in harm’s way, so it is important that action be taken to make the relocation of Great Lakes water a more realizable goal. Freshwater resources are directly tied to the ability for an area’s economy to grow. Parts of the western United States simply are unable to grow because water needs are not being met. So far, too few actions are being taken to avert this growing crisis. While the reduced water usage mandate enacted by California Governor Jerry Brown certainly is a step in the right direction, although it has some major issues. In his mandate, agriculture is excluded. While they undoubtedly need this water, their exclusion makes the water usage restriction much less effective. In fact, the agriculture industry is directly responsible for up to 80% of the state’s water use rates. Agriculture is a massive force in California, and the necessity of massive water use is making the impact of the drought increase significantly. In a sort of Cath-22 situation, one of the state’s leading industries is virtually unable to escape from this self-destructive cycle, making intervention an absolute necessity. As farmers have to use more and more water to keep their crops alive and well in this harsh drought, the rate at which the water levels drops keeps becoming more worrisome. Power plants, both traditional and nuclear both use a massive amount of the Great Lakes water resources. Currently, the top 5 non-agricultural water withdrawers taking daily amounts from these important bodies of water are all power plants. Donald C. Cook Nuclear Power Plant leads this list at the moment; with withdraws reaching an astonishing estimated 2 billion gallons per day from the lakes. Overcoming the various obstacles that stand in the way of relocating water from the Great Lakes to California needs to become a top priority for our nation. Pressuring political leaders at every level will be necessary to enact useful and lasting change. Calling into your local government can help spread awareness in the political world about the importance normal citizens place on this important issue. With no clear alternatives immediately presenting themselves, keeping our focus on potentially reasonable solutions needs to take the forefront of public issues being talked about in today’s political climate. Do your duty to your home nation today by talking to family, friends and strangers about the danger the drought in California presents to the nation as a whole. Educating them about the potential positive impact relocating water from the Great Lakes can have will be the first step toward ensuring our great nation’s future economic and environmental stability.